Mix together all ingredients except the marinara sauce and mozzarella. Mould into 18 meatballs, then cover with cling film and refrigerate for at least 20 minutes. This will ensure the meatballs don't fall apart in the cooking process. Pre heat the Evolve or 360 grill with the deep pan plate attached to the maximum temperature. Add the meatballs to the grill and cook for 8-12 minutes with the lid down, whilst occasionally lifting the lid and to move the meatballs around. Add the marinara sauce to the deep pan, close the lid and bring to the boil. Then turn the grill down to medium and simmer for 10-12 minutes or until the meatballs are cooked through and the juices run clear. 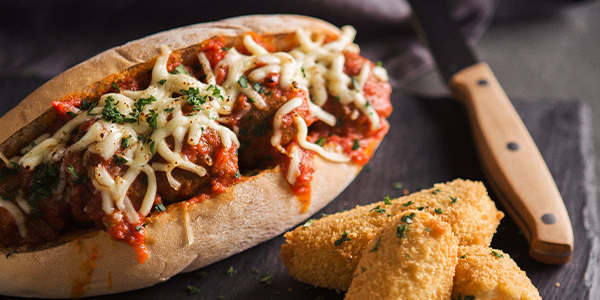 Take the sub rolls and spoon 3 meatballs into each with some sauce. Sprinkle with the mozzarella and some parsley. To serve: serve with mozzarella sticks for the ultimate party meal.